Excellent Kev, you see, it's the simple things in life isn't it which give the most fun? I couldn't agree more. I just hope they think the same when what all their friends want is an i pad! The Americans call cardboard mulching - lasagna gardening. Wish toys made of plastic would naturally decompose the same way. Why is everything made of plastic? I read somewhere that sad you only need rubbish collection for the things yuo buy in, nothing you produce yourself has to leave the homestead. That said I didn't make the box! My son had a large television box that I made into a car for him, he went miles in that thing, travelling the roads of England and one time 'chasing the A Team across America' before it fell to bits a couple of years later. He had his fluffy blue armchair as the drivers seat, a plastic steering wheel with indicators and a ledge for his teddies and shopping to sit on, a true cardboard work of art!! We knew how long he had it because every time our cars tax disc ran out it was glued onto his 'windscreen' he had six 6 monthly discs when it finally gave up the ghost!! Like you say the best presents are sometimes free. Has she missed her box or has the kitchen replaced it completely in her affections? She's not missed it at all but the kitchen is the one toy that she plays with every day - so I think it was a good swap! I remember haing boxes like your sons myself, only ours was a rocket! Ah, that's lovely! Especially the one of you lying on the floor with your head in the box. Many hours spent like that I can tell you! 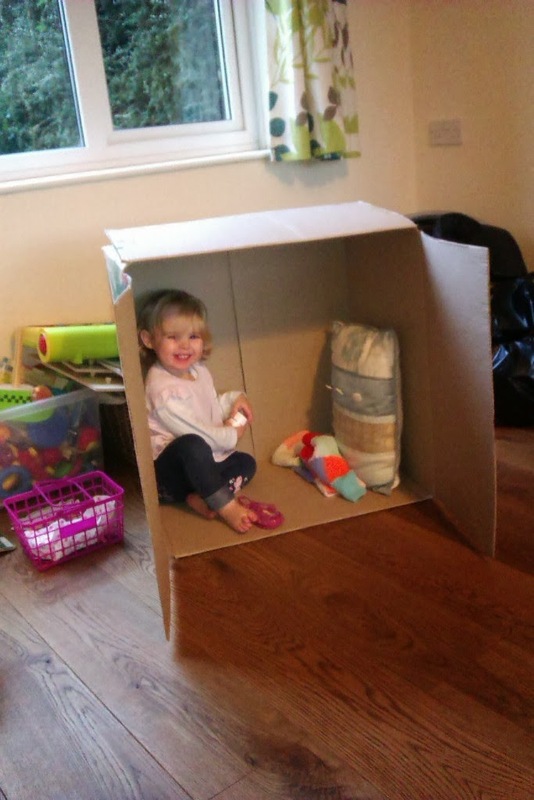 It is amazing how much fun a box can be, I remember playing in them years ago. Ahhh! 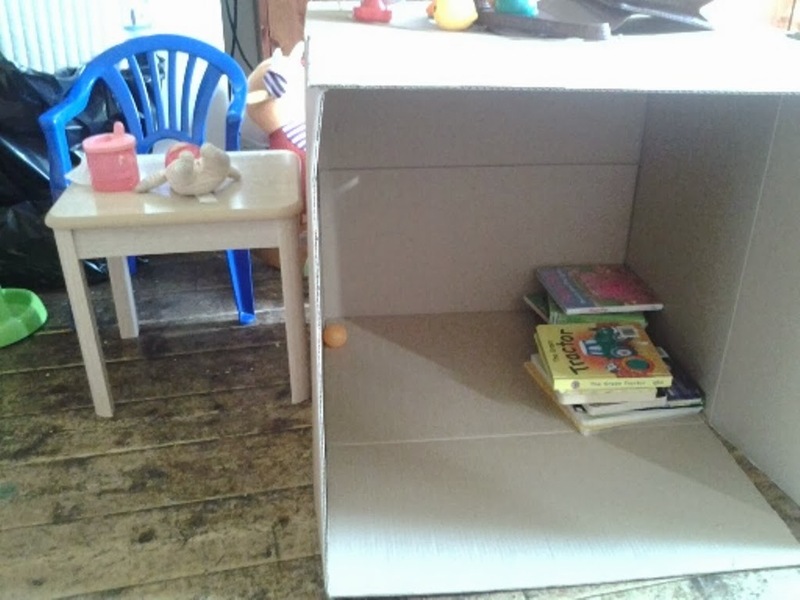 This took me back to when my kids were small, we had a microwave delivered and the delivery driver offered me a very big card board box- two or three kids could fit in it easily. I don't think he wanted the hassle of disposing of it when he got back to his depot. My son, all of 6 years old, cut a drawbridge type door in it with my breadknife- (can't turn your back for 5 mins)and put some string through the drawbridge bit so that it could be pulled up to close it. 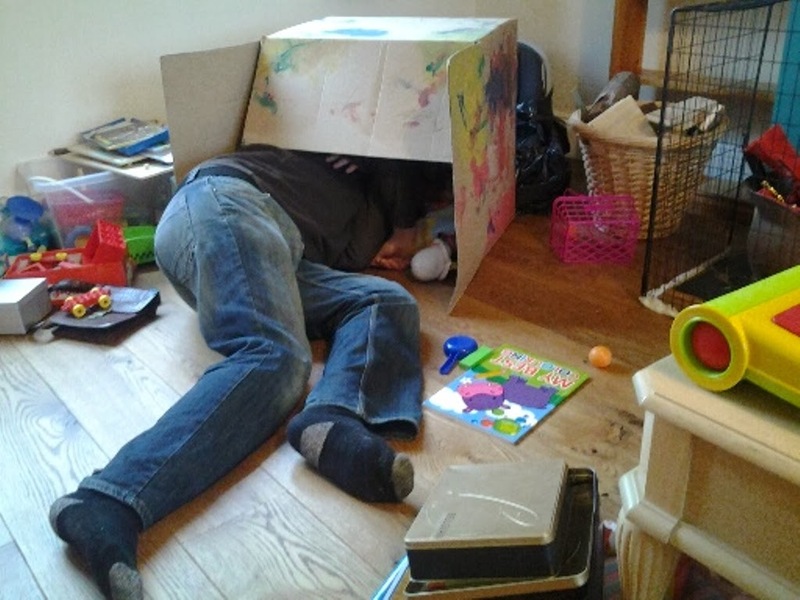 My daughter's third birthday was great, all the kids just played in the cardboard box. Didn't need to organise any games at all that year. All the other mums just thought it was great. Thats sounds like a great castle. I still love making dens even now and can't wait until the summer and we can build forts! Thats how we felt! Maybe your have to wait until next Christmas! I came by to let you all know that I finally got my "What readers are saying" page up and running, but of course I got distracted by all that cuteness! Isn't it wonderful that the most entertaining toys for children are also the simplest? More room for the imagination. Anyway, about the book page, feedback welcome! Thanks for the link! I thnik it's important to let them make their own play and use their imagination. I started listening to your radio interview the otherday - your much better than the DJ!